Who wants a 17-inch laptop when you can get the similar performance from the ultrabooks these days? Well, this is not the case for everybody. Some people do prefer bigger display no matter what and are ready to trade portability for the little more power that the large form-factor laptops have to offer. So, if you’re one of those and looking for the best 17-inch laptop for yourself, then here is a complete guide to help you make an informed purchase of your new laptop. Before you proceed with the list of our most recommended best 17 inch laptops, let’s discuss whether 17 inch laptop is the right fit for your requirements or not. Remember? I told you, I will help you make an informed purchase. So, let’s begin. Shall we? In the process of hand-picking the aptest laptop for your use (and that too from the abundance of varieties), traits like processing power, response time, storage capacity and size may be the chief decision makers. Narrowing the list down to one can never be dependent on a sole characteristic. 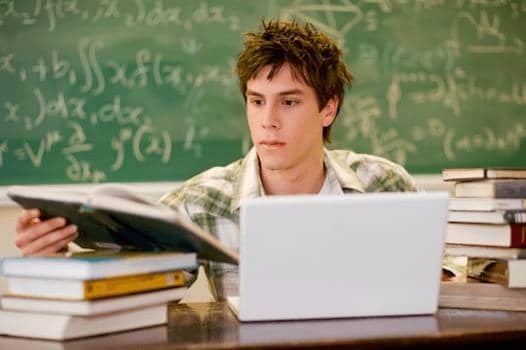 But as ‘laptops’ are primarily preferred for their portability, one might say that the size of the laptop is one of the most important features to take into consideration. Well, the size of laptops can range from small 11-inch netbooks to all the way up to large 17 inch laptops, and that might make you wonder, exactly what kind of usage is a 17 inch laptop fit for? For starters, there is no concrete answer to this, but I can draw a pretty good picture overall. Consider a gamer, it would be immensely difficult to achieve a good gaming experience on a small display. Also, such kind of crowd cares much more about the performance than sleekness and design of the laptop. Moreover, some old school folks don’t want to lose the ‘PC feel’, even on a handheld device. Even after the evolvement of miniature devices, it is still hard enough to find a decent machine with all PC capabilities in under 15 inches. At least, the one which won’t cost you an arm and a leg. Another good use of a 17 inch screen? A shared space. Gives you all the perks of a full-fledged desktop experience, minus the large room take up. Then there are some media artists and photographers who would rather bear a large-sized machine than squint their eyes to smaller ones while creating masterpieces. So, having a larger laptop has its own perks from different perspectives, but certainly, it is not the right choice for everyone. For instance, imagine traveling with a 17 inch laptop and working on-the-go. Not so comfortable. Right? So, here’s your takeaway — If you’re planning to use your laptop from your home or office work desk and if you think that it will sit there probably most of the time then yes, the 17 inch laptops will be perfect fit for all your requirements. But, if you’re the one who has to travel a lot and have to work on-the-go then, 17 inch laptops are a big NO for you. Traveling and working with such huge laptop on your lap is not at all comfortable and therefore I recommend you to buy a smaller 14 or 13 inch laptop for yourself. You’ll find a lot of powerful, lightweight and easy to carry laptops in that segment. So, now if you have decided to buy the 17 inch laptop for yourself then start reading the list of our most recommended best 17 inch laptops below. It will guide you further to make an informed purchase of your new laptop. Well, if you have changed your mind after reading the points above and now deciding to buy a smaller laptop for yourself then don’t leave our site yet. Check out our guide to buy the mid-sized 14 inch laptops and guide to buy the ultraportable 13 inch laptops. I am sure you’ll find your perfect laptop match from there. Lenovo Ideapad 330 is already one of the most renowned laptop but now it has became even better with the latest Intel processor fitted inside. It is a 17 inch laptop as you would expect and packs in a beautiful 17.3-inch massive HD display with a resolution of 1600×900 pixels. The laptop comes with an energy-efficient LED backlight panel, which offers bright colors and impressive viewing angles. Under the hood, the laptop has a Kaby Lake-Refresh 3.40GHz Intel core i5-8250U processor, paired with 12GB of DDR4 RAM for multitasking and app handling. For storage, this laptop bolsters massive 2TB of HDD which is more than enough to store all your data. You can also play some older games and do basic photo editing on this laptop, thanks to the powerful integrated Intel UHD 620 graphics. But is that all it has got? Well, the laptop certainly offers a lot more than these specifications. It comes with the latest Windows 10 OS to give a productive touch to the device. The laptop has all the essential list of connectivity ports and other wireless connectivity options. Moreover, the laptop can get fully charged in about 3 hours, and is expected to last for 4 to 5 hours depending on the work you are doing. On an overall note, the Lenovo Ideapad 330 is an adequately specced, best value for money 17 inch laptop under $500 for basic everyday requirements. If you’re a power user and don’t mind spending a few extra bucks, then this AMD powered laptop from HP does the tasks much faster. 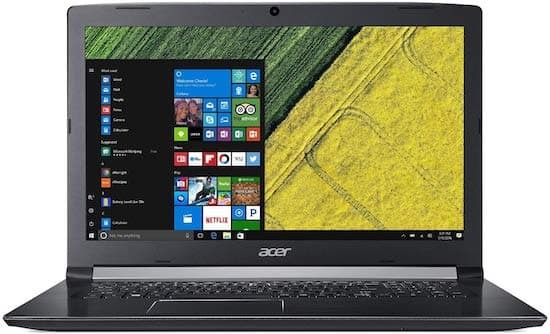 Acer’s Aspire series of laptops has always managed to attract the audience and draw the attention through its impressive set of features at affordable costs. The laptops come with all the possible best combinations of features and specifications; one would expect from a laptop, irrespective of the primary usage. Our current contender, the Acer Aspire 5, sports a brilliant 17.3 inch full HD anti-glare display that protects eyes from strains even after prolonged usage. A 720p webcam is present on the top of the screen which is not the best you can get, but it is good for occasional video calling. The laptop provides all sorts of ports and connectivity options, and DVD drive is also provided, in case you need it. Apart from all these features, the laptop is also jam packed with all the latest and powerful set of hardware specifications, making it one of the most powerful contenders in its segment. It is powered by an 8th generation Intel Core i5 processor with base clock speed of 1.6GHz and turbo clock speed of up to 3.4GHz. The powerful quad-core processor paired with 8GB of RAM handles multitasking on the device very smoothly. For storage, the laptop comes with 1TB of HDD which offers decent amount of space to store all your files and media. Moreover, the laptop also offers an empty storage drive bay inside to upgrade the storage of this laptop with speedy SSD. 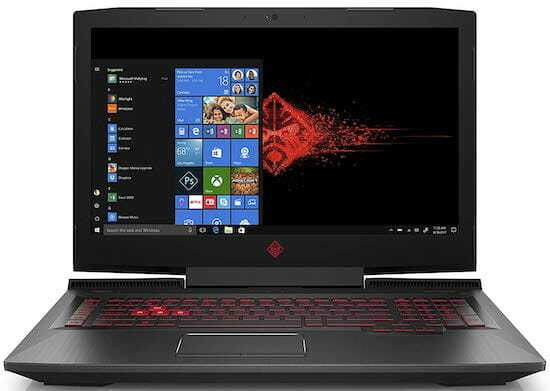 Coming to the gaming performance, the laptop has Nvidia GeForce MX150 GPU which is powerful, but it’s still an entry level GPU. Although it can run almost all the latest gaming titles at scaled down settings, still it struggles to deliver the smooth gameplay on some demanding titles. All-in-all, this is the best budget 17 inch gaming laptop for the audience looking for a large screen, high-performance laptop at a reasonable price. With bigger screen comes bigger entertainment! This holds absolutely true to our current device, the 2019’s latest HP 17z laptop. It comes with a bright 17.3-inch HD+ display with a resolution of 1600 x 900 pixels. The display panel is a WLED backlit enabled one and is glossy in nature. While it does provide good viewing angles, still it’s certainly not the best for outdoor use as it is not anti-glare. 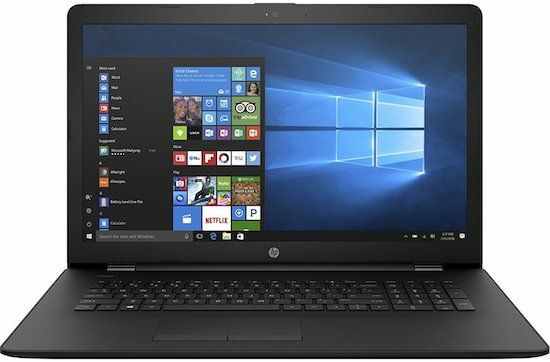 On the hardware front, this HP laptop bolsters a powerful 3.4GHz AMD Ryzen 3 processor with 8GB of RAM and 1TB of mechanical HDD for storage. Graphics on the the laptop are backed by an AMD Radeon Vega 6 integrated graphics. Overall performance of the laptop is pretty smooth and it runs all sorts of software, apps and even games without any problems. In spite of the laptop’s huge display, it manages to offer excellent ergonomics. The laptop comes with a weight near to 5.6 lbs and is just 0.9-inch thick which makes this one of the best 17 inch laptop for frequent travelers. One of the biggest benefits of buying a laptop with the large form-factor is, it provides more room to fit the hardware. Accordingly, this HP laptop packs in a huge battery pack and is expected to last over 6 hours of continuous usage on a single charge! I think this is really impressive considering the price of the laptop which is near to $400. 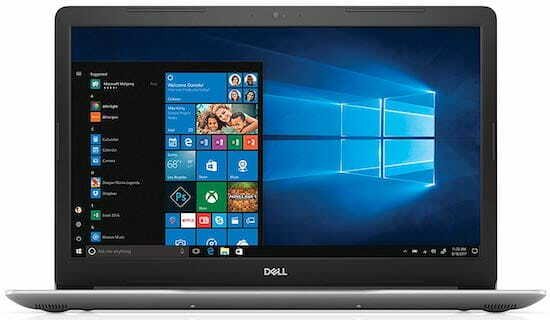 Dell Inspiron series of laptops needs no introduction in the field of laptops. This latest Inspiron laptop comes with an impressive set of specifications along with a large and bright display. Sporting a 17.3-inch super wide Full HD anti-glare display; the laptop is known to provide an immersive experience while watching movies and playing games. Featuring the powerful 8th generation Intel Core i7 processor paired with an 8GB of RAM, this laptop can handle multitasking, gaming and other demanding works with ease. Storage on the laptop is again as massive as its display and comes with a 1TB of HDD and 128GB of SSD, which is an ample amount of storage for any user. The laptop comes with a Windows 10 operating system, which adds on to the productivity of the device. This gaming-stationed laptop features major features with other multimedia based features such as solid audio and video experiences. Graphics department on the device is also pretty well managed by the powerful AMD Radeon 530 dedicated graphics coprocessor which is again great considering the price of this laptop. On an overall note, the Dell Inspiron i5770 is the best choice for the people who are looking for the best all-around performing 17 inch laptop under $1000 with high-performance hardware and sleek and elegant design. The Acer Predator Helios 300 17 is a powerful gaming laptop from the company and features top-notch specifications. The device boasts a sharp, true-to-life 17.3-inch full HD IPS display with 144Hz Refresh-rate. The display gets bright up to 300-nits which is rather great for a laptop this caliber. 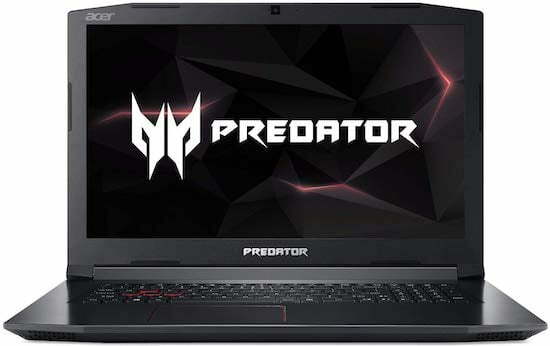 Under the hood, the Acer Predator Helios 300 has latest 8th generation Intel core i7 hexa-core processor and Nvidia GeForce GTX 1060 overclockable graphics card. All the power generated from CPU and GPU is paired with massive 16GB of RAM which outputs enough throttle of power to play all the latest games of 2019 and do other demanding works with ease. For storage the device has a hybrid storage which consists of a 256GB of SSD drive along with 1TB of SATA HDD which is also more than enough to store all your favorite music, movies, games and other files. Apart from hardware, the laptop also has an excellent sounding speakers inside. It comes with 4 speakers setup powered by Acer’s TrueHarmony surround and Dolby Audio sound system which delivers true to life audio experience while playing games and watching movies on this laptop. As you can tell, the Acer Predator Helios 300 17″ excels in almost all the segments. With latest Nvidia GPU, fast Intel processor and RAM the laptop is capable of handling almost everything you throw at it. 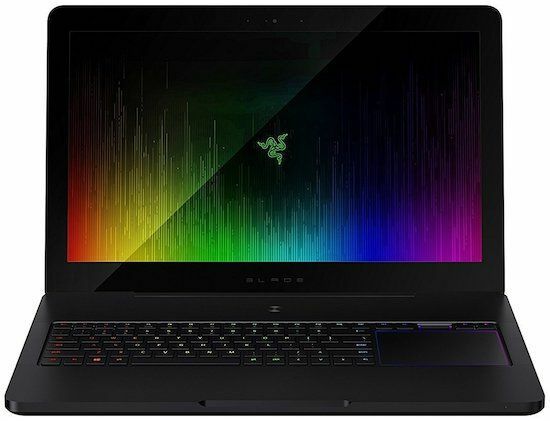 So, if you’re looking for a best desktop replacement 17 inch laptop that doesn’t cost arm or leg and can run all the latest gaming titles, handle high resolution photo editing or 4K video editing, then this laptop is the one that you should go with. Alienware series of laptops from Dell are globally renowned to be the best gaming laptops and are very premium built. Accordingly, the new Alienware 17 R5 is also built with premium materials and stuffed with all the latest hardware. Talking about the build quality, the laptop is completely built using copper and magnesium alloy. The outer chassis of the laptop feels very durable and provides better grip and ergonomics. Of-course it has a 17-inch display. Well, to be more specific it has a 17.3 inch IPS display with an anti-glare coating on the top. 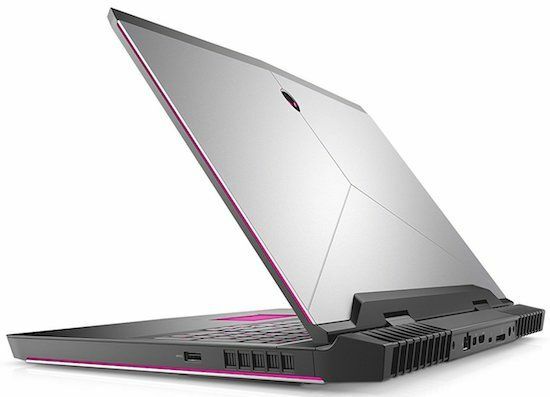 The display of the new Alienware laptops can get bright up to 300-nits which is remarkable considering the other brand laptops in similar price range. The beautiful display on the device is tuned at 120Hz to deliver rich gaming experience with a minimal 4ms response time and it is also Nvidia G-Sync enabled. So pro-gamers, I think your hunt of best 17 inch laptops end here. Speaking about the hardware, the Alienware 17 R5 comes in variety of different hardware options and can be bought even with the newest Intel Core i9 processor. But, that top-of-the-line model costs a lot and it is not for everyone. The configuration that we recommend is, 8th generation Intel core i7 processor, 16GB of RAM and Nvidia GeForce GTX 1060 overclocked GPU with 6GB DDR5 graphics memory. For storage, you can opt for 1TB HDD and 128GB SSD. But if you want more then it can also be configured with up to 512GB of SSD. To say the least, the Alienware 17 R5 is not the laptop that I would recommend all the power users to buy because there are many other laptops that offer similar set of specifications and features at much lowered prices. But, if you are the one for whom the looks are as much as important as the specs of the laptop, then the Alienware 17 R5 is definitely the best 17 inch laptop for you. 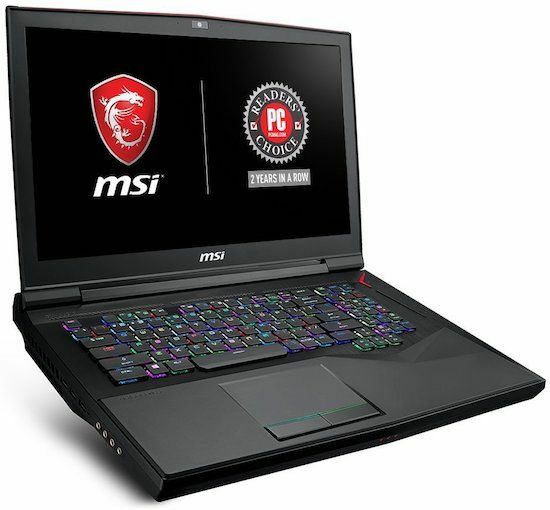 Another gaming laptop in our best 17 inch laptop list which is also from a well-established brand – MSI. This gaming laptop will leave you speechless with its powerful innards and an even incredible display. Sporting a 17.3-inch full HD IPS display, the GT75VR Dominator is an ideal choice for all the gaming enthusiasts who are looking for a laptop that provides incredible gaming experience. The display has 120Hz refresh rate with a minimal response time of just 3ms so screen tearing and jittering problems while gaming were the problems of past with this laptop. This MSI GT75 TITAN is the also built like a tank with all the high quality materials all-around. It has an aluminum chassis which looks and feels very premium to touch. However, traveling and working on-the-go with this laptop is almost impossible and even it is unusable by keeping in lap. It is a huge laptop which weighs 10 lbs. So, only buy this laptop if you are planning to use it by keeping it on the desk. Talking about the performance, this laptop is a multimedia powerhouse. Thanks to the flagship 8th generation Intel Core i9 hexa-core processor paired with massive 32GB of RAM and Nvidia GeForce GTX 1080 GPU with 8GB dedicated graphics. This hardware combo generates a lot of power and can run all sorts of graphics intensive games and software buttery smooth. For storage this laptop offers 1TB of hard drive and 512GB of fast solid state drive which is also more than enough for all types of users. Overall, the MSI GT75VR TITAN is a very capable machine. It can be perfect replacement to your desktop to play all the latest games or do graphics intense works such as CAD and 3D rendering or video editing. If you’re looking for a 17-inch laptop with a 4K display, then this HP Omen 17 is the perfect option for you. Boasting a large 17.3-inch 4K IPS panel, the display offers good color reproduction and amazing viewing angles. Moreover, the display is backed by an Nvidia G-Sync technology to deliver smooth and jitter free gameplay. The laptop also comes with a unique design aspect, which makes it one of the sturdiest 17-inch laptop in the segment. It is built entirely from high-quality plastic and its lid has carbon-fibre like finish to provide grip. The laptop is built like a tank and there are no flexes anywhere on this laptop. But, that tough build quality comes at a cost of portability. Traveling with Omen 17 in a backpack could boor the shoulders as it weighs around eight and a half pounds. But, if you’re the person who will be using laptop from one place all the time then I think you won’t find any better laptop than this one, at least not at the price that it comes for. Under the hood, the laptop is powered by the 8th generation Intel core i7 six-core processor paired with a 32GB of DDR4 RAM. On the storage front, the laptop offers a 256GB of SATA SSD and a 2TB of mechanical HDD to accommodate both efficient and larger data storage options. Graphics on the laptop are again pretty well managed. It has Nvidia GeForce GTX 1070 with dedicated 8GB DDR5 VRAM making it VR compatible. Playing games and watching movies on the device is going to be a treat to the viewer’s eyes, all thanks to its large high resolution display and surround sound, which provides an immersive experience. The laptop is able, powerful, and is crafted to perfection, and is therefore on our list of best large screen laptops. All the laptops mentioned above in the list boasts one common feature, and that is a 17 inch display, and all laptops are highly specced. But, what makes this 17 inch laptop unique in the segment is its “convertible” nature, which makes this laptop usable as both, a laptop and a tablet. This Dell Inspiron 17 7000 series laptop boasts a large 17.3-inch full HD touchscreen display which produces true to life visuals. The display on the laptop is rotatable up to 360 degrees to use this laptop in a tent or tablet mode. Although it is quite uncomfortable to use such a huge laptop in tablet mode, but once you get used to it, you can take benefit of the huge screen space that this convertible 17 inch laptop has to offer. Being versatile in nature, this laptop doesn’t even miss out in providing a good performing hardware. With that said, the Dell Inspiron 17 7786 2-in-1 comes powered by the newest Whiskey Lake Intel Core i7 processor with 16GB of RAM which remain standard across all variants whereas buyers do get choice to choose from different storage options. 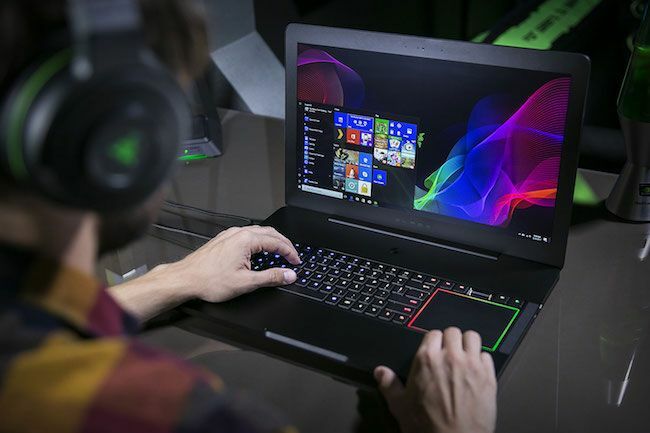 Moreover, the laptop also offers discrete Nvidia GeForce MX150 GPU to handle graphics intensive workloads. 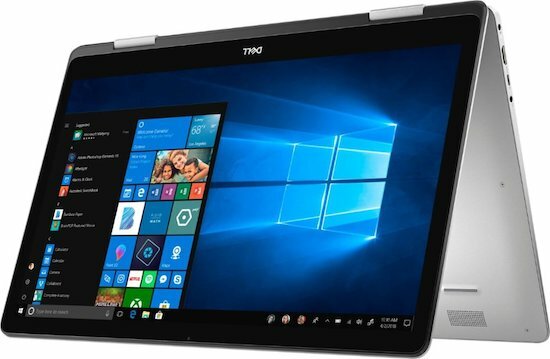 All in all, the Dell Inspiron 17 7786 is the best convertible 17 inch laptop you can buy right now and it is our pick in the segment of large screen laptops if you need a bit of versatility alongside productivity. The Razer Blade Pro is a true desktop replacement laptop which packs in an ultra high-end hardware in the thinnest chassis possible. It has an unibody all metal chassis design which is just 0.9 inches thick. Still, in this small frame, Razer managed to fit in the hardware that’s usually found in the thick and bulky laptops. It is powered by an Intel core i7 quad core processor with massive 16GB of DDR4 RAM. 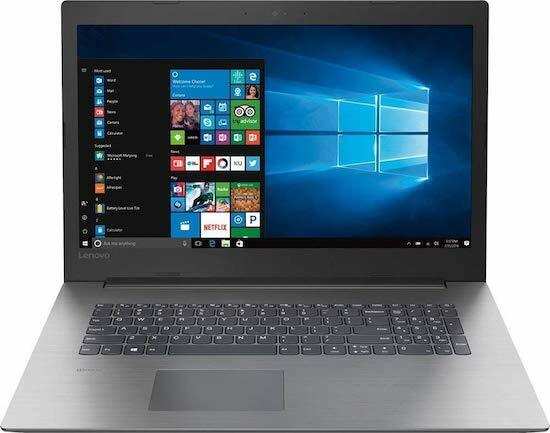 For storage, this laptop comes with 2TB HDD and 256GB SSD and graphics on the laptop are backed by Nvidia GeForce GTX 1060 6GB DDR5 graphics. An incredibly powerful GPU inside such small frame is what makes this laptop unique among all other 17 inch laptops. Apart from its high-performance hardware, the Razer Blade Pro bolsters 17.3 Inch full HD display with 120Hz refresh-rate and powered by G-Sync which delivers enhanced gaming and multimedia experience. The display on the laptop is not just strong on paper but is also equally attractive when it comes to real-time usage. It is a sharp and very bright panel that provides excellent viewing angles in all types of surroundings. Moreover, the laptop is also the world’s first laptop to be THX Certified Mobile Device by the legendary audio/visual brand which makes it an equally great laptop for entertainment purposes. The Razer Blade Pro is the best 17 inch ultrabook you can buy right now. It excels in a lot of segments and provides features that are unique on its own. Hence, it truly deserves to be on our list of best 17 inch laptops. It can be a perfect replacement to your desktop or can be your travel companion for on-the-go gaming or everyday productivity. 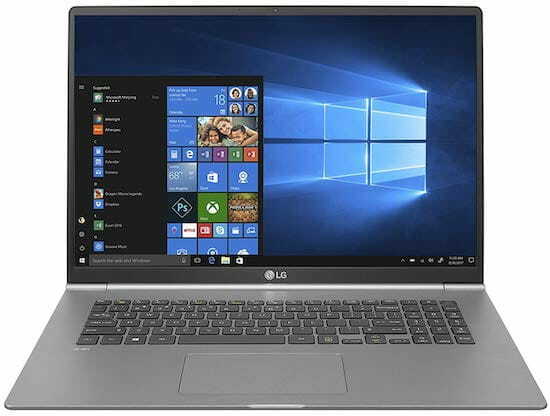 If you are after the thin and light 17-inch laptop, then recently launched LG Gram 17 is the thinnest of ’em all. It offers newest Whiskey Lake Intel Core i7 processor with 16GB of RAM and 512GB of SSD storage in the chassis that weighs under 3 pounds and just 0.7 inches thick. It isn’t as powerful as Razer Blade Pro but it’s great for general productivity. So, if you want a thin and light large screen laptop then this is probably as thin as it gets. These are our current top picks of 17 inch laptops. Starting from screen size and brand, all the way down to processor and GPU, this list relates all mentionable 17 inch laptops available today. Even then it varies from user to user, the standpoint of the ‘best 17 inch laptop’ suitable for their routine. So you might always need to do a little research of your own before finalizing the winner and figure out which fits best in your description of a ‘compatible personal computer’. We hope that this buying guide helps you to buy the best large screen laptop for yourself. Keep visiting this page to see an updated list of laptops. Mike Johnson is senior editor of this website - Laptop Under Budget. He along with the team of laptop professionals, helps people in buying best laptop within their budget.